Everyone likes the idea of turning the ugliest house on theblock to the best house on the block and making a profit. Until nowa system has not been shared on how to successfully complete thistask on time and budget without getting your hands dirty. This booknot only cracks the code but shares the proven path and system tohave a systems based rehab business that makes consistent profitsfor ordinary everyday people. 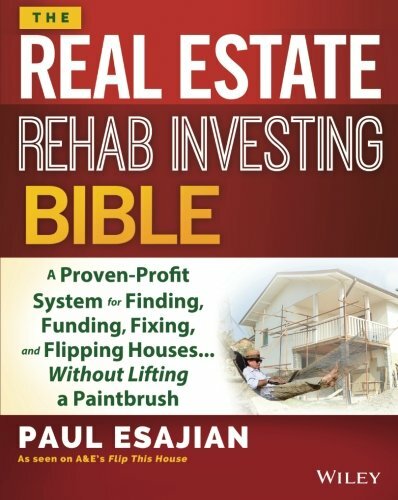 The Real Estate Rehab Investing Bible revealsthe lucrative seven-stage system that allows author Paul Esajian,and his students all across North America, to manage multiple rehabprojects at once, while staying on time and under budget to buildand grow their wealth. No experience? No problem. You'll learnstrategies to find the right properties, negotiate the right offer,identify the right licensed and insured contractor for the job, andget the property sold to a happy homeowner for a profit. No capital? No problem. You'll learn how you can use otherpeople’s money to fund your deals and the IRS guidelines thathelp you keep more of the money you make. By learning andleveraging the principals of rehabbing and real estate, you'llstart thinking like a business owner rather than a consumer. Breaking into residential real estate provides an amazingopportunity for those with little, or no experience, and usingother people's money. This book gives you the information,education, and systems every investor needs to start flipping andrehabbing houses without doing the work yourself,and withoutlosing your shirt to contractors and badinvesting decisions. The proven techniques Paul shares work in any location, in anymarket. If you're ready to get in the game, The Real EstateRehab Investing Bible teaches you how to play.